I know a lot of collectors who have the bracelet-bug. Like everyone else, they started collecting watches and eventually gravitated to a certain genre. Most folks are happy with narrowing their focus to a time period of watches but a select few notice how many watches are paired with a unique and stylish bracelet. Something happens to them... and they go a little crazy. Some even buy the bracelets first - and then try to find the watch to go with it! They are strange, strange people. (just kidding of course). Personally I appreciate the creativity of design and how the right bracelet complements, and often completes the watch. Sometimes it goes so far as the watch just doesn't look right without it's bracelet. A good example is the 1961 Holden. I recently picked up a watch that made wonder how hard it would be to find the bracelet. It's a 1961 Ramsey. It was made for two years. The Ramsey was an entry-level model in Hamilton's line up. However, just because it was an entry level watch, that doesn't mean it wasn't interesting. Maybe it was just a little less interesting than some of the other really cool models in this time period. The Ramsey is a round watch and some people consider that to be "boring". The embossed dial has numerals at 12 and 6 and little bow-tie shaped markers at 3 and 9. The other positions have sliver-shaped markers. There's a textured band that goes around the circumference of the dial and adds even more visual interest to the watch. What I like about the bracelet design is it echoes the bow-tie markers and the textured band. I bet it looks really cool in reality. But alas, my watch arrived naked of a strap or bracelet. The back is engraved with a presentation to an employee of Amphenol-Borg. Amphenol merged with Borg in 1958 and made small electronics, automobile clocks, and other stuff. Like Hamilton, it's history post 1960 was checkered with various acquisitions, divestures and take overs. But at least in 1961 the company still appreciated it's employees. Without the beat up crystal in the way, you can get a really good idea of the features of the embossed dial. It's not the prettiest dial I've ever seen but it is very interesting, especially when compared to other period models with very plane dials. The movement inside the case is a Swiss-made Hamilton 673 with 17 jewels. The 673 was made by A. Schild and is based on their 1200 grade. You'll find the same basic movement in other manufacturer's cases but Hamilton called this specific movement the 673. A. Schild was an "Ébauche " maker. An "Ébauche" is a partially finished movement... maybe 95% complete, and sold to someone else to put their finishing touches on. Many times you'll find the makers mark inside the movement near the balance jewel. Typically it's a shield-shaped mark with initials of the maker and a number denoting the grade. You might be able to make out AS 1200 in the shot below. Knowing the original maker of the movement helps in getting parts. The crystal on this watch definitely needs to be replaced. A lot of times I will use a PK-style low down crystal on a watch like this with a sub-second hand. But the crystal I took off was a little higher than a PK so I'm going to go with a PHD, high dome, style in 30.1mm. That way I know the hour and minute hands will have clearance. The movement is reassembled and ticking away with good motion. It's off to the timer for a performance assessment. Right on the money... nothing to complain about here. The dial and hands go back on and everything slips back into the two-piece case. A nice lizard strap completes the restoration. I think this watch would look great with it's original bracelet but it looks pretty darned good with a strap too. 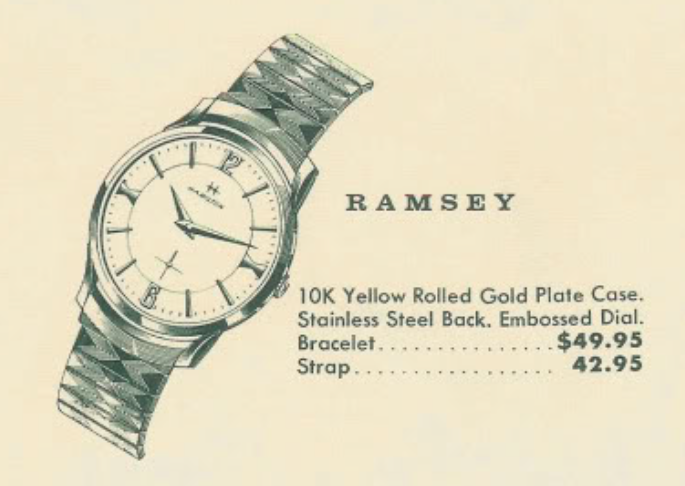 Maybe one of my friends will contact me about this watch - as this is the first Ramsey I've ever seen and I wouldn't be surprised if there's a bracelet waiting for one of these watches to show up. $75 -$100 is a fair expectation for a professional watchmaker to charge for a watch like this. As for its value... depends on condition but fully restored probably in the $200-$25 range.